I can remember my first days on Facebook, connecting with classmates from high school and college. I enjoyed reading their updates and seeing pictures of their family and their adventures. As my friend count grew, so did my use of Facebook. Checking in at fun destinations, tagging friends and family members I became a little competitive with my posts. Since my use of Four Square, my check in activity has decreased but I still enjoy posting pictures of friends and family members. Since my parents joined I sometimes use Facebook to keep them posted on my activities. Facebook has changed its format many times since I started using it and I’m still not sure how to control my news feed but I have been using it lately to follow things I’m interested in. When I like my favorite television shows, I get updates on episodes. I also get updates from charities and companies that I like. If you like your favorite magazines, you will receive fun pictures and information about promotions. I was reluctant to use the like feature too much but now I’ve embraced it and I love reading the posts from the pages I like. This like feature is also great for those of us looking for current trends and deals. I have liked almost all of the retail companies I can find where I like to shop. If you want to know what is trending in fashion, follow some companies such as Banana Republic, DSW, J.Crew, Sephora, Saks, etc. If you are into buying house wares, check out Wayfair, Pottery Barn, Williams Sonoma, etc. Pick your favorites and follow them I would also challenge you to branch out and find different companies to follow. Looking for a deal? I will give some examples of the deals posted. Kohl’s is introducing their Derek Lam collection in stores April 5th but today only you can buy these pieces exclusively online. Lord & Taylor had an online deal recently for 50% off all spring coats. On March 13th Macy’s posted this deal: Macy’s VIP Sale: save an extra 20% or 10% in-store & online. So go ahead and like your favorites to find trends and deals! I don’t tweet as much as I read the tweets. I follow celebrities, magazines, friends, as well as the same companies and designers I follow on Facebook. The posts on Twitter are limited in character number and therefore are easier to scroll through. You will find your favorite companies posting trends and deals on Twitter . I’m a huge fan of Instagram. I love taking pictures and seeing how Instagram can add an artistic flare to them. There are a lot of creative and fun pictures posted on Instagram. Just like Facebook and Twitter I follow my favorite designers and companies. Instagram can mostly be used to follow the current trends but you can find deals and promotions. 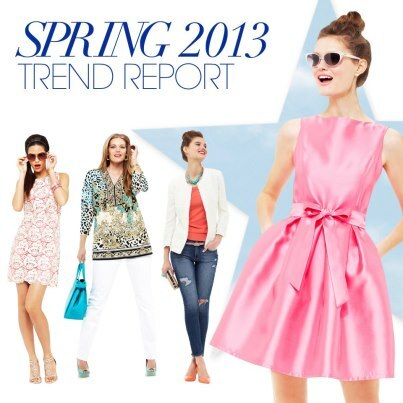 Macy’s is running a promotion right now; if you post your favorite fashion trend you could win a $1000 Macy’s gift card. 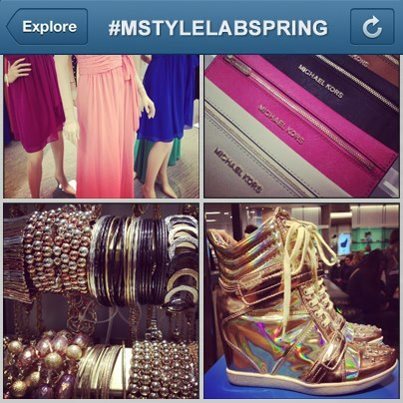 You have to follow Macys on Instagram and use the following hashtag with your picture #mstylelabspring. The promotion ends on March 24th. If you are new to using social media, it might take some time for you to learn the logo but you should definitely start by following people and companies. You will find ideas on how to create your own fun posts!